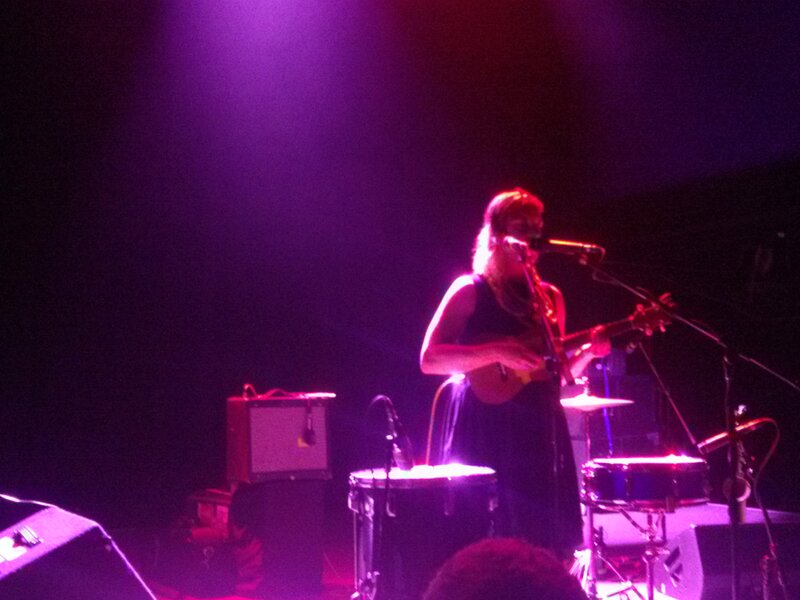 Last night was a sold out tUnE-yArDs show at DC’s 930 club. While Radiohead played a sold out show at the Verizon Center in Chinatown, it didn’t even matter. The crowd was so glad to see Merrill Garbus back in DC. The last time we saw her, she played two shows in one night – both sold out – at the Black Cat last fall. It’s fun to see an artist return to the same city and play a bigger venue. tUnE-yArDs has been all over NPR and have managed to find their way into the mainstream while remaining true to what they want to create. Their accessibility, and likability, can be the real story here. One of the best parts about the evening was the diversity in the crowd. I watched two black girls in front of me pass text message notes to each other about being able to count the minorities they could see on one hand (there was some diversity, but not a ton we could see from being so close to the stage.) Meanwhile, I saw underage ‘tween’ sized fans who were chaperoned beaming with excitement while right next to them, a much older grey haired man was going berzerk over the saxophonists. tUnE-yArDs is signed to 4AD records, also the home to Deerhunter, Bon Iver, St. Vincent, Ariel Pink, the Big Pink, and The National. I was writing about her just under a year ago over here, the New Yorker was also beginning to fall in love. Raised in Connecticut, Garbus studied in Kenya and learned to yodel to help preserve what she thought was a dying singing voice. She lives in Oakland, California now -which lends to her lyrics about politics, race, and economics. Her incredibly unusual sounds seem to reach across all formats from experimental jazz (via saxophone), hip hop (via her looping drum beats and chanting), funk (due to bass lines), while her folksy manner comes from her ukulele. The only complaints I’ve heard about tUnE-yArDs, is the capitalization thing. It comes from the age of MySpace. She did it to grab your attention. And it worked. Merrill wears that haircut with one side shaved head, the other side long hair. Usually there is some paint on her face (they all had some) and she dresses like a lady when she performs. While she acknowledges the accompaniment of her band mates, they stay out of the spotlight when she’s on stage. Her fan base is incredibly devoted. She herself is a normal sized woman, which is an inspiration to any of us who isn’t model size. It’s nice to see a beautiful woman embrace her body and be a voice for the unusual. She inspires and introduces non-traditional ways (African throat singing anyone?) to traditional people (the state of Connecticut.) Merrill Garbus can fill a space with her voice unlike any other performer I’ve ever seen. Her face becomes animated and her ability to reach certain pitches – while keeping track of every unusual time in her looped-pedal-controlled hooks – is immaculate and impressive. She is a terrific performer and has a wonderful stage presence. Currently on tour, I suggest trying to see this show live if you can. Maybe the eight piece mariachi band, Mariachi El Bronx, will still be opening for her.